I admit to having a soft spot for John Grisham novels. It started when I entered college and didn’t really have a lot of time to read for pleasure. Grisham’s books were easy reads, yet interesting and fun. I think I have read almost everything he has written, with the exception go Calico Joe. That being said, I was very excited when I heard he was writing a sequel to one of my favs, A Time to Kill. I loved that book, and it doesn’t hurt that I think of Matthew McConaughey whenever I think of Jake Brigance. 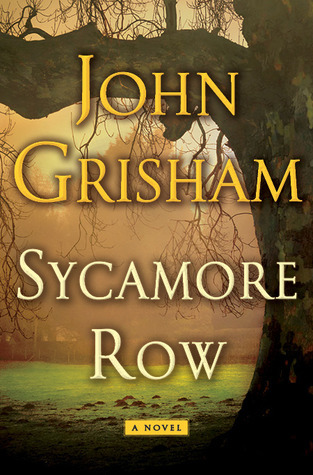 Sycamore Row picks up with Jake and all the original characters three years after the Hailey trial. Jake become involved in the trial to challenge a handwritten will of a white man who killed himself, and left almost everything to his black housekeeper. It might seem at times that Grisham follows a formula to write his courtroom dramas, but this is a fun, captivating, fast read. If you enjoy legal dramas, and a look into sour country’s complex race relations, I word definitely recommend this book! My friend who enjoys legal thrillers etc has been trying to get me to read John Grisham forever! like I said- he’s one of my guilty pleasures- so much fun! I’ve read a few Grisham novels but never A Time to Kill. Do you think I need to read that first before digging into Sycamore Row? Yeah- i would prob say you should. But it is a very good book. I picked up Sue Monk Kidd’s latest based on your review. I loved A Time to Kill. I can’t wait to hear how you liked it! I enjoy John Grisham, too. He’s a nice, quick, lighter type of read. And my husband reads his books, so it’s perfect because we have some mutual books to talk about.